Meeting Thursday evening for the second of three planned gubernatorial debates, Democratic Gov. 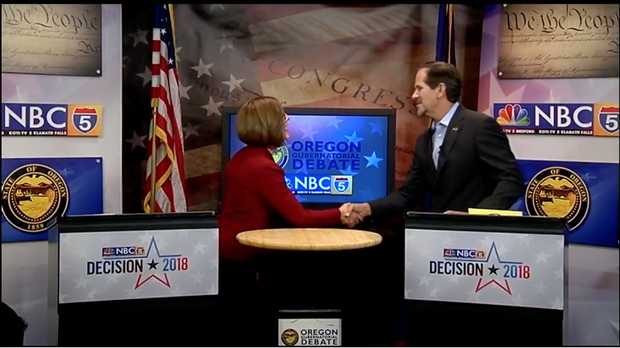 Kate Brown and Republican state Rep. Knute Buehler were more willing to attack each other's record than when they’d faced off two nights before. On a wide array of issues, Brown and Buehler set forth at the Medford event to build a narrative about their opponent. As he has since spring, Buehler questioned Brown’s “status-quo” leadership, saying she’s failed the state on important issues like education, homelessness and overall stewardship of public dollars. “This is an issue that has to be dealt with,” Buehler said of the state’s lagging school system, the central issue of his campaign. "(Brown is) not willing to spend the political capital to tell her biggest supporters that this problem has to be fixed." Brown hit back, painting her opponent as a political chameleon whose campaign trail promises on issues like immigration and gun control don’t match his nearly four years in the state Legislature. “I feel like I’m running against two candidates: Rep. Buehler and candidate Buehler," Brown said. Despite the occasional barbs, the debate was cordial — and packed more substance than style points from the two candidates. In an hour, moderators from Medford’s KOBI-TV managed to cover issues that included transportation, gun control, natural disasters, drug addiction and homelessness. It even roped in President Donald Trump and Judge Brett Kavanaugh, the president’s controversial pick to fill a vacancy on the U.S. Supreme Court. Throughout it all, the one-minute answer format allowed the candidates to largely stick to talking points. But Brown and Buehler also took nearly every opportunity to rebut. Missing from the debate was Independent Party candidate Patrick Starnes, who’d participated two nights earlier. The event’s sponsor declined to include Starnes, saying surveys showed he didn’t meet a threshold of support from 10 percent of voters. Looming large was Measure 105, the ballot measure that would repeal Oregon’s 31-year-old sanctuary law. Buehler has said he’ll vote for the measure. He said Thursday that the sanctuary law, which bans the use of local law enforcement resources to enforce federal immigration law, is a “broken set of policies.” Buehler has also said he supports the basic premise of the law. “I’m already confused about my opponent’s comments about where he is on Ballot Measure 105,” Brown responded, listing off a series of immigrant-friendly bills she said Buehler had opposed. On the Kavanaugh nomination, Buehler said that he believes President Trump should pick a new jurist for the Supreme Court. That appeared to be a new stance from the candidate, who had previously said he found both Kavanaugh and Christine Blasey Ford, the woman who’s accused him of sexual assault, to be credible. “At this point I strongly believe that President Trump should withdraw the nomination and put someone forward who can gain bipartisan support,” Buehler said. Brown reiterated her call for a new nominee. When discussion turned to the state’s problematic public pension system, the candidates were asked to rate it as an item of concern on a scale of one to 10. Costs for paying down a $22 billion unfunded liability in the system increasingly eat up money that could otherwise go to other services, such as public education. Brown rated the problem an eight, but attacked Buehler’s suggestion that public employees be required to pay into the system with money that, today, goes into personal retirement accounts. “I don’t think it’s appropriate that we cut retirements of our hardworking Oregonians, like firefighters,” Brown said. Buehler, who has pledged meaningful reforms to the system, rated its problems a nine on the scale. In one of the more telling exchanges of the night, the candidates were asked to name a program they’d cut or shrink to help balance the state’s next budget, which may face a sizable shortfall. Buehler, who’s declined to answer the same question with specifics in the recent past, didn’t hesitate to say he'd cut a clean fuels program that requires the use of gasoline that emits less carbon dioxide. Buehler earned enemies in the state’s environmental community for voting against that program in 2015, but he insisted on Thursday that groups like the Sierra Club oppose similar programs because of concerns about the environmental impacts of ethanol. Brown, on the other hand, refused to single out a program for budget cuts. When talk turned to earthquake preparedness, Brown touted the passage of a $5.3 billion revenue package last year for transportation projects statewide, a package Buehler opposed. As she did on Tuesday, Brown attacked Buehler for voting against two gun control provisions that have become state law: one that allows courts to take guns away from people deemed a threat, and another that expands background checks. Buehler, a gun owner, said he supported “common sense” gun control measures like outlawing bump stocks, creating a three-day waiting period to buy handguns, and increasing the legal age to purchase “assault weapons” to 21. The candidates will meet for their final debate Tuesday in Portland.